This 2 foot hose and rod are mostly used for sub slab treating of termite problems. If you already have one of our 6 gallon, 20 gallon or Dial-A-Mix Pint size sprayers and need to do some sub slab treating, all you need is this hose and rod. The hose attaches to the nozzle of either sprayer and the rod is then inserted through access holes for direct applications. Mostly done sub slab (under cement slabs), this is a key treatment site for most termite applications. This combo with the right sprayer will enable you to get the chemical where it’s needed without having to spend hundreds on fancy professional equipment. 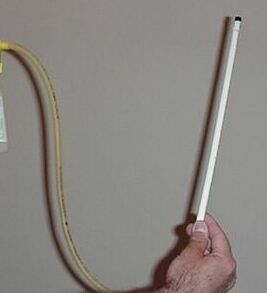 The rod can also be used for directly treating ant mounds or plant root feeding.